Four Democratic candidates have withdrawn from Michigan's Jan. 15 presidential primary, leaving what amounts to a beauty contest to front-runner Hillary Rodham Clinton and a handful of lesser-knowns. John Edwards and Bill Richardson filed paperwork Tuesday, the deadline to withdraw from the ballot, said Kelly Chesney, spokeswoman for the Michigan Secretary of State's office. A fourth candidate, Joe Biden, said in a statement that he was bypassing Michigan's primary, calling it a beauty contest. Later in the day, the Clinton campaign issued a statement saying the New York senator will remain on the ballot. "We're honoring the pledge and we won't campaign or spend money in states that aren't in compliance with the DNC calendar," said Clinton spokesman Jay Carson. "We don't think it's necessary to remove ourselves from the ballot." "Today's decision reaffirms our pledge to respect the primary calendar as established by the DNC and makes it clear that we will not play into the politics of money and Republican machinations that only serve to interfere with the primary calendar," said Biden for President Campaign Manager Luis Navarro. Chris Dodd also said he would remain on the ballot. Hari Sevugan, Dodd's communications director, suggested in a statement that the potential of alienating voters in a state expected to be a 2008 battleground played a role in the campaign's decision. "We are committed to the importance of Iowa and New Hampshire going first, and we signed the four-state pledge to hopefully prevail upon the DNC and the state parties to add clarity to that situation," Sevugan said. "However, it does not benefit any of us if we are the nominee to pull our name off the ballot and slight Michigan voters." Other Democratic candidates had until the end of the day to decide if they'll stay on the ballot. As punishment, the DNC has vowed to strip Michigan and Florida, which scheduled its contest on Jan. 29, of their delegates. "We're very disappointed and this is another example of why the monopoly that Iowa and New Hampshire have needs to end," said Michigan Democratic Party spokesman Jason Moon. He declined to speculate about whether the party may decide to move back its primary, or to hold a caucus instead. 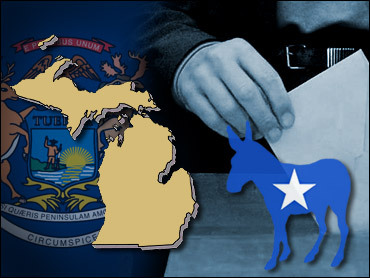 Michigan Republican Party Chairman Saul Anuzis said the decision by the Democrats just opens Michigan to more campaigning by Republicans hoping to win the state and its electoral votes.